As heard today on the Rush Limbaugh Show there is a long checklist of things you will need if you buy a new Mercury Filled CFL light bulb. You may know that the sale of incandescent light bulbs are banned after 2012 so eventually you may be forced to purchase one of these dangerous bulbs. Invented by Thomas Edison in the 19th century the incandescent light bulb truly changed the world like no invention before. For over a century the picture of a light bulb, sometimes drawn over a person's head, was the symbol of a great idea. 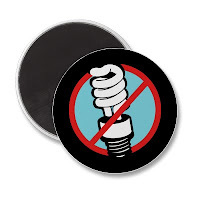 Well, soon they will be banned, in favor of expensive mercury-filled bulbs made in China. Too easy - right. Now the steps required to clean up one of these Curly Fry Light Bulbs just follow these simple steps put out by the EPA. Have people and pets leave the room, and avoid the breakage area on the way out. Open a window or door to the outdoors and leave the room for 5‐10 minutes. Shut off the central forced‐air heating/air conditioning (H&AC) system, if you have one. a. Have people and pets leave the room. c. Shut off the central forced air heating/air conditioning (H&AC) system, if you have one. d. Collect materials needed to clean up broken bulb. a. Be thorough in collecting broken glass and visible powder. b. Place cleanup materials in a sealable container. fragments or cleanup materials indoors. Cleanup Steps for Hard SurfacesCarefully scoop up glass fragments and powder using stiff paper or cardboard and place debris and paper/cardboard in a glass jar with a metal lid. If a glass jar is not available, use a sealable plastic bag. the used tape in the glass jar or plastic bag. and any materials used to clean the vacuum, in a plastic bag. Promptly place all bulb debris and cleanup materials, including vacuum cleaner bags, outdoors in a trash container or protected area until materials can be disposed of properly. paper/cardboard in a glass jar with a metal lid. If a glass jar is not available, use a sealable plastic bag. and any materials used to clean the vacuum, in a plastic bag. trash container or protected area until materials can be disposed of properly. And the really good news is these Mercury Bulbs cost as much as SIX TIMES as much as a traditional incandescent light bulb! I'm 'hording' the bulbs designed by Edison! Check out the insert that comes with vaccines that contain thermirisol, they have special disposal instructions too because of the mercury. Verily maybe it's time and past time for me to start buying edison bulbs in bulk, and storing them for after the turn of the banned year. Whatever Bill this is stuck in must be repealed NOW.